Be gone standard white! The ceiling is now considered such an important element in a space that it is often referred to as the fifth wall in decorating. Painting or adding a design element to a ceiling can really change a space from ho-hum to awe-inspiring, but the best news is that decorating a ceiling is a very budget-friendly way to freshen a space. If you are considering banishing your ceiling’s boring white, here are a few ceiling decorating ideas to get your creativity flowing. In small spaces, painting the ceiling the same color as the walls (or one shade lighter) can make the room feel larger. On ceilings with molding, try a​ neutral color (such as light beige, ivory or gray) on the ceiling to make your molding really pop and give your space an elegant look. If your walls and furnishings are neutral in color, consider adding your main color on your ceiling (a classic color such as rich plum or red often works well) to draw the eye upward and give your room some vibe. Decals, stencils or even decoupage work well on smooth ceilings and give a room a surprise ingredient that can really add an individual touch to a space or for a custom look, paint a design on your ceiling to draw the eye upward. Small decorative wood moldings are inexpensive, and with a bit of paint or stain and a touch of hot glue, a ceiling can easily be transformed into the most interesting feature of a space. You can make your ceiling appear like an expensive, trayed ceiling by painting a soft pinstripe or border around the edge of your ceiling. Choose two paint colors similar in tone to achieve this look. 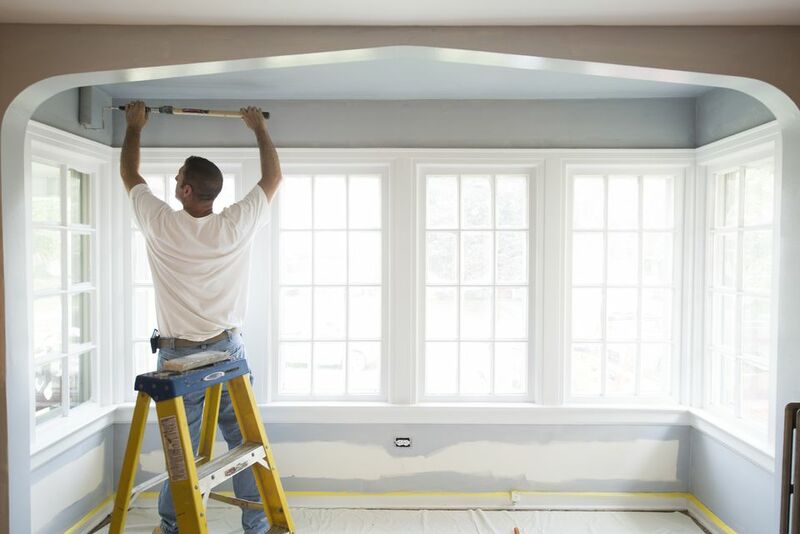 Cool colors tend to recede into space while warm colors often make something appear closer, so consider this when choosing your ceiling paint colors. If you choose your ceiling to be your main color element in your room, don’t forget to “spread the wealth” by adding throw pillows, vases and other decorative accessories in the same color. Can You Really Just Spray on Wall and Ceiling Textures? How Do You Create an Open Beam Look in a House?